I planned to write a blog about this wonderful and popular free verse, but I found Wikipedia had said all I intended to say. So I'm just reprinting here pertinent portions of the Wikipedia article. 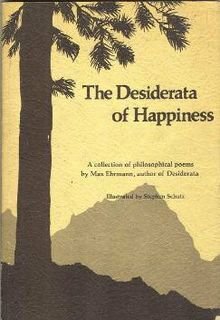 Desiderata (Latin: "desired things", plural of desideratum) is a 1927 prose poem by American writer Max Ehrmann (1872-1945). The text was largely unknown in the author's lifetime and became widely known after its use in a devotional. 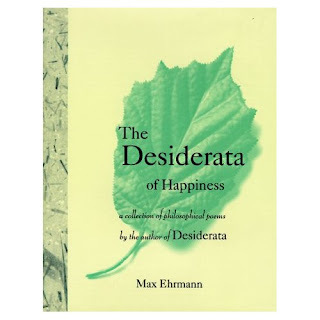 Some time around the year 1959, Reverend Frederick Kates, rector of Saint Paul's Church in Baltimore, Maryland, included Desiderata in a compilation of devotional materials for his congregation. The compilation included the church's foundation date: "Old Saint Paul's Church, Baltimore A.D. 1692." The date of the text's authorship is widely mistaken as 1692, the year of the church's foundation. When Adlai Stevenson died in 1965, a guest in his home found the Desiderata near his bedside and discovered that Stevenson had planned to use it in his Christmas cards. Subsequently, the poem became widely known as having been found at Saint Paul's Church of Baltimore – but confusing the date of the church's foundation as the date of the text's authorship. The text was widely distributed in poster form and in late 1971 and early 1972, Les Crane's spoken-word recording of Desiderata peaked at #8 on the Billboard chart and No. 6 on the UK Melody Maker's chart. The makers of the record assumed that the poem was too old to be in copyright, but the publicity surrounding the record led to clarification of Ehrmann's authorship and his family eventually receiving royalties. In August 1971 the poem was published in Success Unlimited magazine, again without authorization from Ehrmann's family. In a 1976 lawsuit against the magazine's publisher, Combined Registry Company, the 7th Circuit Court of Appeals ruled that copyright had been forfeited because the poem had been authorized for publication without a copyright notice in the 1940s – and that the poem is therefore in the public domain. On August 26, 2010, a bronze statue of Max Ehrmann sitting on a park bench was unveiled in Terre Haute, Indiana, his hometown, with the sculpture done by Bill Wolfe. On a nearby walkway, some lines of the poem are also available to be read by passersby.